The High Street chain Timpson is offering to dry clean suits for unemployed people for nothing. It hopes this will help them succeed in job interviews, writes Justin Parkinson. Interviewers like job candidates to look smart. Jeans, T-shirts and trainers are generally a no-no in a lot of roles. Wearing a suit is expected for many interviews, even if the job itself does not involve dressing smartly. Clothes stains are said to "turn off" 59% of executives, with the remaining 41% probably ambivalent at best when confronted with the remains of a meal or a night out. 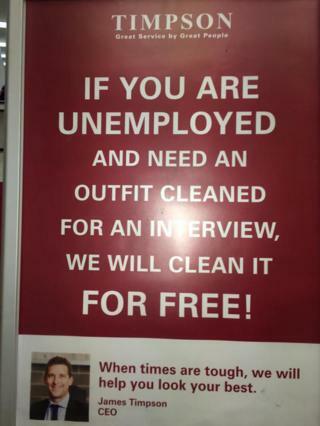 The Timpson chain, which also offers key-cutting and shoe repairs, has put up posters outside its stores proclaiming: "If you are unemployed and need an outfit cleaned for an interview, we will clean it for free." The offer, in place since 1 January, has been taken up by hundreds of people, Timpson chief executive James Timpson says. "When people are going for interview it's important to look and feel smart and getting their suit dry cleaned is part of that," he adds. "It makes people more confident and gives them that 2% extra chance of getting a job. We just thought it was a really good idea." Timpson, which started in Manchester in 1865 and now has 1,395 stores around the UK, is not asking people to prove they are unemployed to get the free drycleaning. "We just trust customers," says Timpson. "We had one lady who came in with a cocktail dress and we told her to hold on. But that's the only instance of a customer taking advantage." UK unemployment fell by 63,000 to 1.96 million in the three months to the end of October, according to the latest Office for National Statistics figures. The government is offering jobseeker's allowance claimants one-off help for people to buy smart clothes for job interviews, alongside assistance with skills such as writing and numeracy and updating CVs. Timpson says its action is part of the same effort to reduce unemployment. "It's a marvellous offer to make," says Michele Rigby, chief executive of Social Firms UK, an organisation which helps disadvantaged people back into work. "It could make a huge difference to people. It's not just about turning up but about feeling confident about yourself. If people are smartly dressed their confidence improves and that helps the way people present themselves." The idea has already been tried in the US. Plaza, a dry cleaning firm in Portland, Oregon, has been offering free services for the unemployed ahead of job interviews since 2010. It has fewer restrictions than Timpson on the type of clothing to be cleaned, agreeing on one occasion to handle two women's bathing suits. The firm has not kept a record of the number of take-ups, but several customers whose job interviews were successful have returned to thank Plaza's staff. "It isn't us, though. It isn't Plaza. It's our paying customers that make this possible," manager Kathey Butters has said. "If we didn't have our regular customers, we couldn't clean at no charge. That's who deserves thanks." Rigby says she can't think of anything similar being done by a UK company before Timpson. The firm says there is no time limit on the free dry cleaning offer or any restriction on the number of times an unemployed person can use the service. Frances Crook, chief executive of the Howard League for Penal Reform has described James Timpson as "utterly wonderful". But Timpson, which employs ex-offenders in its stores as part of their rehabilitation into society, admits its thinking is not just based on altruism. James Timpson reasons that people who use the free drycleaning service will move on to paying for it when they get into work. "It's all about running things the right way," he says. "People get it."